I learned a new way to make chicken soup. Not a new recipe, but a new technique. Who would have thunk it! 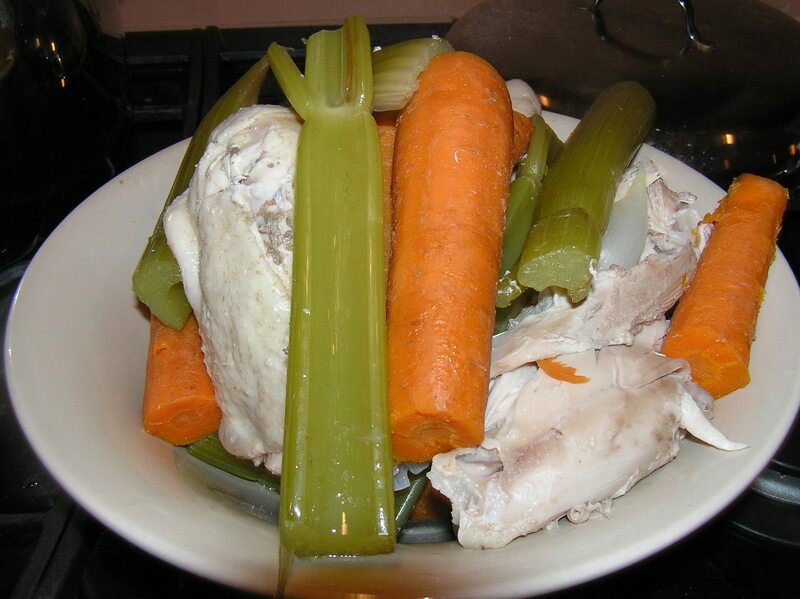 I have made chicken soup the same way forever – a fat chicken, an onion stuck with a few cloves, celery, and carrots. Throw them in the pot and cook forever. This is the way my mother and grandmother – and probably generations before that, made chicken soup. Well, maybe not the cloves. The only thing I ever remember my mother doing with whole cloves was sticking them in the cross hatches on the top of a canned ham – a recipe that I think involved pineapple rings and brown sugar. And I don’t remember Grandma Freydl ever using cloves, whole or ground. The only spice I remember Grandma using was cinnamon, in fantastic cookies and cakes. The chicken soup is always delicious, but my big disappointment has always been the chicken breasts, which should have come out tender and succulent, but after several hours of cooking had every bit of flavor cooked out of them and tasted like cardboard. They weren’t even good cut up and put back into the soup. Then I read a recipe that said if you wanted to use the chicken breasts for a meal, cut the chicken in quarters and REMOVE THE CHICKEN BREASTS AFTER 20 MINUTES OF COOKING. Revelation!! The breasts are succulent and can be eaten for dinner, or on a sandwich, put back in the soup after it is finished or whatever. The dark meat can withstand the continued simmering, so it can stay in the pot and continue to add flavor to your soup. Put 5 quarts (20 cups) of water into an 8-10 quart pot. 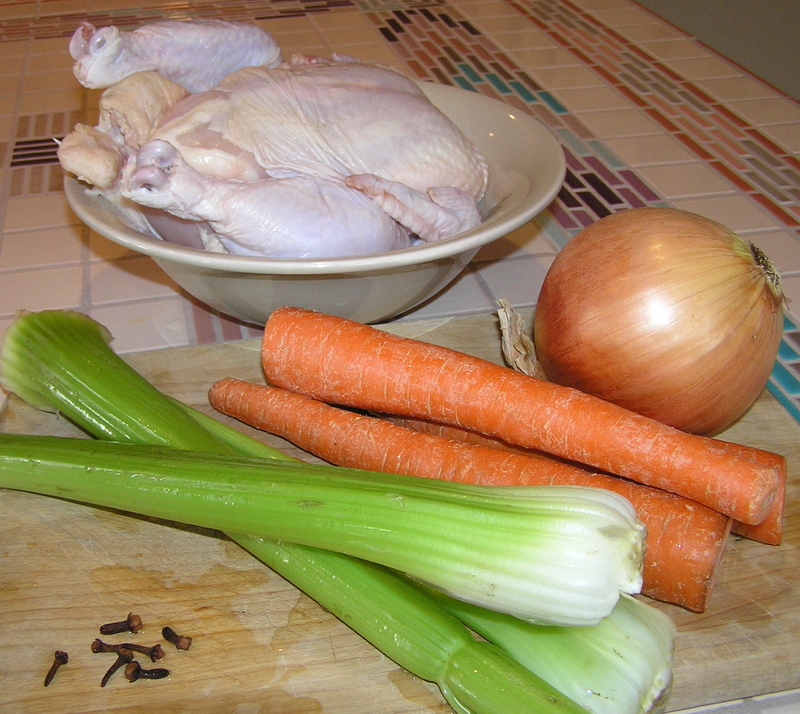 Add the chicken, onion, carrots and celery to the pot. I usually peel the carrots because I am fond of cooked soup carrots, but you don’t have to. I take the chicken wings off so they can stay in the pot after I remove the chicken breasts, and leave the skin on everything to add flavor to the broth. I take the skin off after the chicken is cooked, and before I add it to the soup for serving. NOTE on salt and pepper: I usually don’t add salt or pepper to the soup until I use it. That way, if I am using the broth as a base for something that has soy sauce or fish sauce as flavor, I can control how salty the resulting dish will be. Bring the broth to a boil, skimming the impurities (the grey stuff that floats to the top) off occasionally. Reduce heat and simmer covered for 20 minutes, skimming occasionally. At this point, remove the chicken breasts. If you are energetic, you can take the skin off the chicken breast, and remove the meat from the bones and toss the skin and bones back in the pot. I’m usually not that energetic. I just want to sit down and eat the nice juicy chicken breast. Continue to simmer the broth, covered, for another 1 1/2 hours. Remove the chicken and vegetables from the broth and set aside. Allow the broth to cool for about 20 minutes. 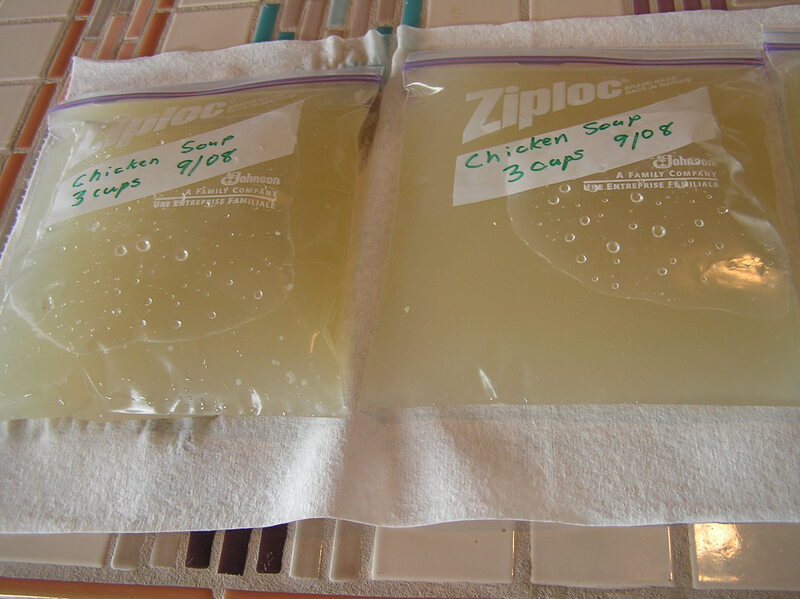 Strain the chicken broth into a large container or two. I use a small, fine strainer, but you can use any strainer or colander lined with cheesecloth. Put the strained broth into the refrigerator for at least 3 hours or over night. 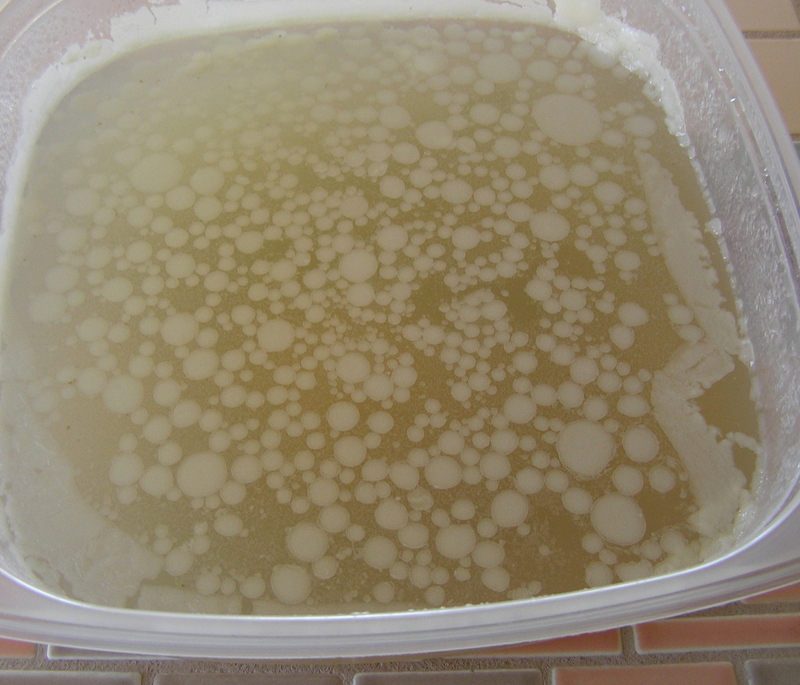 When you take it out of the refrigerator, the fat will have risen neatly to the top and solidified. Skim every bit of the fat off the broth. 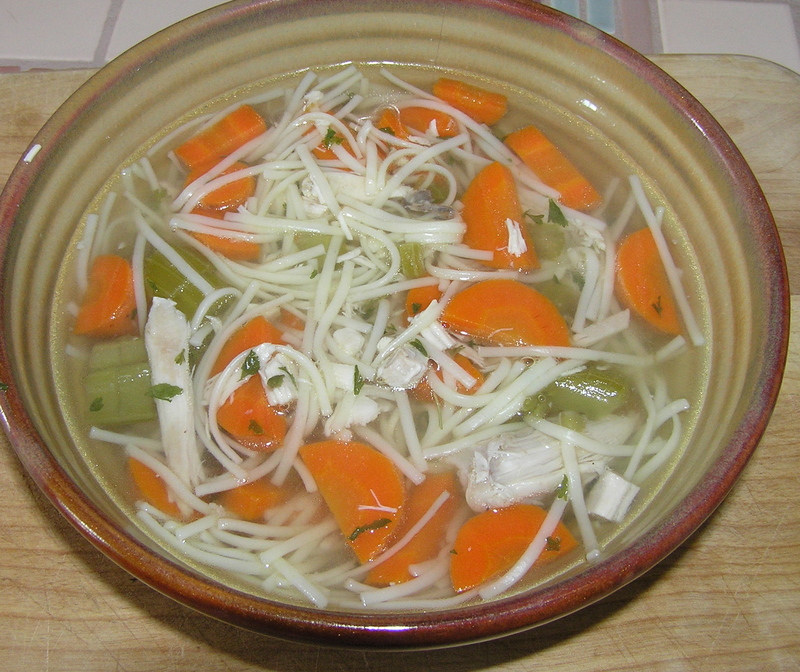 Although I take every bit of fat off the broth, I usually count the resulting chicken soup as having 1 gram of fat/cup, since I am sure that I don’t do as good a job of removing fat as store-bought chicken soup. You are now ready to use the broth for whatever you want. My immediate use was to make chicken noodle soup for myself and my friend Tizzy to warm us after working outside in the brisk fall air. I cooked fine No Yolks noodles, skinned and cut up the chicken thighs, cut up the remaining soup carrots (I ate one of them right out of the pot the day before), and two of the stalks of cooked celery. I added a tablespoon or so of dried parley flakes, as well. I warmed 4 cups of broth, and added the noodles, etc., to heat through. We each seasoned our soup to taste with sea salt and freshly ground pepper. Our big bowls of soup had about 8 grams of fat. I froze the remaining broth to use in later recipes. Hint: You can freeze any soup in sturdy zip top bags, which takes up less room in the freezer, as long as you make sure that the outside of the bags are dry, and you have room to freeze them flat before you stack them.